by Thomas R. Keen, Ph.D. 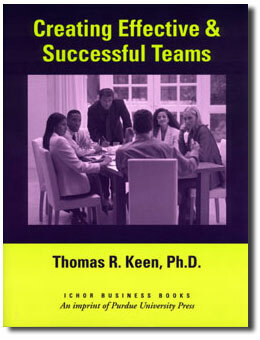 This book provides a basic primer on how to create successful and effective teams. It is appropriate for large, medium, or small non-profit or for-profit organizations. The practical tips included in this book detail a wide array of team-oriented helpful hints. These practical application tools can be utilized to improve teams if they already exist. If teams do not exist, it provides a step-by-step process in creating a team-oriented environment, such as how to create a team culture in the organization and a specific organizational design that will make teams more effective. It also covers the essentials of teamwork that are critical to making teams effective. The orientation of this book offers a new paradigm for selecting and managing teams. It differs from other books as it describes exactly how to match the right people for each team. Each team player has two roles to bring to a team—their functional/professional role based on their expertise (i.e. a financial background), and a team competency role that is based on their innate personal strengths. Creating Effective and Successful Teams describes how to leverage each team member’s functional/professional-based competencies with a set of personality-based competencies that can translate into a particular team role they would best play to make teams effective and successful. Dr. Thomas R. Keen has over 30 years of experience in business, research, and academia. His areas of proficiency include strategic management/planning/development, executive development and coaching, team assessment and design, management leadership assessment, marketing relevancy, and consumer behavior. Keen’s wide range of experience offers a unique skill set that provides a senior management business perspective, an understanding of human behavior, ability to leverage team/group dynamics, and a personal coaching approach. He has also published and presented in the areas of Team Structure/Evaluation and Design, Strategic Management, Intuitive Decision Making, and Managerial Leadership and Effectiveness. Currently, Keen is an associate professor and chairman of the business department at Caldwell College in Caldwell, New Jersey.